Walnut Street Fire Company No. 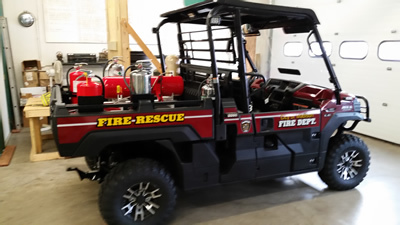 4 will house a city-owned fire utility vehicle, a Kawasaki Mule. It carries 50 gallons of Class A foam, two pressurized water extinguishers, two 20-pound dry chemical extinguishers, a Class K extinguisher and assorted tools. It can also carry a stokes basket for transporting patients. The unit will primarily be used during Madison’s many festivals when access is limited for first line fire apparatus, and it can be used in rough terrain.